Make a plant pot lighthouse! Add a touch of coastal style to your garden with this clever and simple craft project. 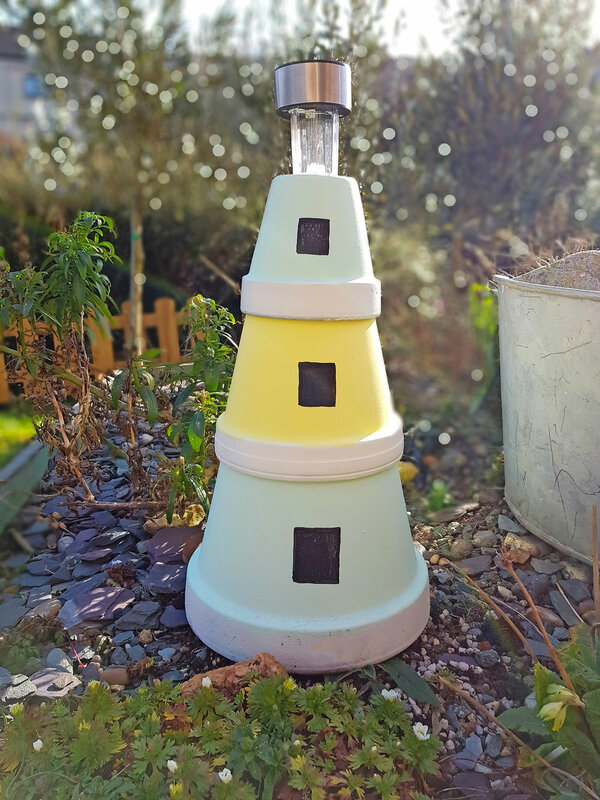 This cute plant pot lighthouse will brighten up your garden both at day and night, so start crafting! Add a layer of adhesive around the inside of the medium pot and stack on top of the large pot. Then put adhesive on the inside of the small pot and stack on top of the medium pot. Leave the adhesive to dry as per the product instructions. Saw off the plastic stake end of the solar light and affix the solar light to the top of the smallest pot using the adhesive. Draw a square on each pot using the permanent marker and colour in to create the windows. Wait for it to get dark and watch your lighthouse light up!